SCOTTSDALE, AZ--(Marketwire - October 12, 2010) - NKK Switches, the world's leading designer and manufacturer of innovative electromechanical switches, today announced the availability of the HS16 Series of power rated, standard size rotary switches. The HS16 Series offers engineers the versatility of multiple pole configurations, among other options. HS16 Series switches are available in single pole through six pole configurations. Multiple poles are achieved by stacking decks, these devices are available in shorting (make before break) or non-shorting (break before make contacts) models. 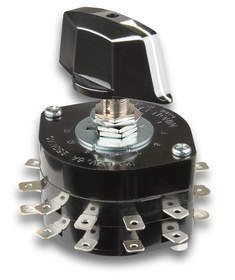 With a diameter of 65mm, these rotary switches have 30 degree indexing. Engineers can choose to use the HS16 series in two through 11 positions depending on the needs of the application. Rated up to 12A @ 125V AC or 6A @ 250V AC, the HS16 Series' mechanical life is 15,000 operations minimum and electrical life is 7,500 operations minimum. The operating temperature range is -10 degrees to +70 degrees Celsius. Terminals are solder lug and made of phosphor bronze material. The HS16 series is cULus Recognized. Design engineers can specify the HS16 Series rotaries with knurled or D-flat shafts. Shafts are constructed of brass with nickel plating and the cases are molded in phenolic resin material. Two different size knobs constructed of phenolic resin are offered for use with the D-Flat shaft option. These knobs are black with a white indicator line for setting positions. Standard hardware provided with all devices includes hex mounting nuts, a locking ring and a split lockwasher. A leading designer and producer of electromechanical switches, NKK Switches offers one of the industry's most extensive selections of illuminated, process sealed, miniature, specialty, surface mount and programmable switches. NKK manufactures more than 3.5 million toggle, rocker, pushbutton, slide, rotary, DIP rotary, keypad and keylock switches, each of which can be used as the foundation of a customized design. All switches are designed and manufactured to provide the quality and dependability that has made NKK the benchmark for reliability for over half a century. NKK continues to lead the industry in responding to the needs of the marketplace with innovation, high reliability, customization and a commitment to excellence. The company provides a full suite of customization solutions that include: design, programming, printing and support. Downloadable 3D CAD models of the company's switches are available, allowing design engineers to quickly integrate complex models into their designs at no charge. NKK maintains a complete network of qualified representatives and distributors through the United States, Canada, Central and South America, Europe and Asia. Engineers who design the human-machine interface for their products rely on the broad product line, specialized design expertise and customer support of NKK Switches. For more information, contact NKK Switches, 7850 E. Gelding Dr., Scottsdale, AZ 85260. Phone: (480) 991-0942. Fax: (480) 998-1435. Visit the NKK Web site at www.nkkswitches.com.